Living: Indoor with regular exercise and a large fenced yard if possible. This sturdy little dog has short legs and the way it is groomed makes them look even shorter. Even so, it is a strong, active animal and surprisingly agile. The coat is compact, course, and hard as bristles with a soft undercoat that protects it thoroughly from bad weather. It comes in black, wheaten, or brindle of any color. 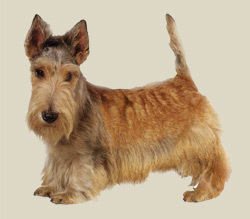 Sharply pricked ears give the Scottish Terrier a thoughtful look. It has a large nose and large teeth, and there is a stop between the skull and the muzzle. Its dark eyes are almond-shaped, and its neck is muscular. Its tail is medium-length, carried straight or slightly curved. Nicknamed the Diehard in reference to its rugged character, the Scottish terrier is a tough, determined character, ready for action. It is fearless and feisty and may be aggressive toward other dogs and animals. It is reserved, but friendly, with strangers, and devoted to its family. Although independent and stubborn, it is sensitive. It tends to dig and bark. This is a dog on the lookout for adventure, and it needs some excitement and exercise in its life every day. This can take the form of a moderate walk on leash, a boisterous game or an off-leash exploration in a safe area. Although it could live outdoors in a temperate to warm climate, it is far better suited as a house dog with access to a yard. Its wire coat needs combing two to three times weekly, plus shaping every three months. Shaping for pets is by clipping, and for show dogs by stripping.